The available evidence reveals that although librarians have made good progress in adapting library services and products to current realities, usage of libraries remains low. This situation has been attributed partly to the poor marketing of library services to actual and potential users. Therefore, the library services delivered using shoestring budgets are barely used, occasioning great “losses” to the libraries and their communities. Social media marketing offers a unique opportunity for libraries to increase their visibility and usage by taking services and products to the platforms where their actual and potential users already “hang out.” Many libraries in Africa are experimenting with diverse social media marketing tools in an ad hoc manner with mixed results. 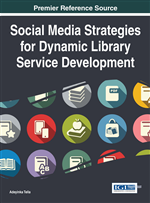 This chapter is a practical guide that libraries can use to enhance their competitive advantage through social media marketing. It offers step-by-step action plans and tips on social media marketing for African libraries. The origin of the term social media is fuzzy with many people claiming to have coined it. However, there seems to be consensus that the term was coined in America Online (AOL) in the early 1990s around the time the company developed Instant Messenger which enabled registered users to communicate in real time (Bercovici, 2010). Broadly defined, the term refers to any online platform or channel which disseminates user generated content and facilitates extensive user participation. The social media phenomenon represents a major shift in communication as it flattens the world and brings people together to be friends, interact or transact. The focus of social media is on interaction and relationships through unrestricted conversations. Social media provide a way to connect and share content and experiences. The strength of the social media lies in the fact that social conversation is one of the most powerful communications in this generation. Consequently, social media tools and techniques are permanently changing the way information is created and passed across societies and around the world (Smith, 2009). Safko (2010) defines social media simply as the media humans use to be social. He explains further that social media are how humans use emerging technologies to effectively reach out and connect to the other human beings, create a relationship, build trust and be there for each other. Kaplan and Haenlein (2010) define social media as a group of Internet-based applications that build on the ideological and technological foundations of Web 2.0, and that allow the creation and exchange of user-generated content. Thus, they perceive social media as comprising of technological platforms, tools and applications which people use to share content, opinions, insights, experiences and perspectives. Although social media are ever growing and ever evolving, their basic tenets remain the same. People have been creating or joining groups of other like-minded persons for ages. Therefore social media are about how humans reach out and connect to other humans, create a relationship and build trust necessary to create a closely knit unit. Social media can further be described as the Internet sites where people interact freely, sharing and discussing information about each other and their lives using a multimedia mix of personal words, pictures, videos and audio (Curtis, 2013a). In addition, Curtis (2013a) explains that individuals and groups play a critical role in sustaining interactions on social media by creating and sharing content on these media sites thereby engaging in person-to-person conversations. Walker (2014) also explains that any technologies people use to communicate and socialise with one another, typically online, can also be perceived as social media. Safko (2010) adds that social media is the use of social interactive media to create or co-create value and thrives on the instinctive human need to connect to the other humans. It is evident, therefore, that social media are forms of electronic communications through which users create online communities to share ideas, information, personal messages and other content. Thus social media is construed to be the collection of online communication channels dedicated to community-based input, interaction, content sharing and collaboration and is a reflection of the ordinary conversations happening everyday in people’s lives offline in the markets, village paths, churches and households. Nonetheless, social media augments and escalates the breadth and depth of the conversations. Agichtein et al. (2008) as well as Morgan, Jones and Hodges (2012) argue that social media is different from the traditional media in terms of quality, reach, frequency, usability, immediacy and permanence. Kietzmann (2011) proposes a social media honeycomb which consists of the participants’ identity, conversations, sharing, presence awareness, relationships, reputation and groups.